There are basically two school of thought when it comes to evaluating job quality: is it an objective property of the job (i.e., wages, hours, benefits), or is it a subjective property of the employee (i.e., how happy/miserable your job makes you)? For this week’s update, I want to look very briefly at reported measures of job satisfaction. 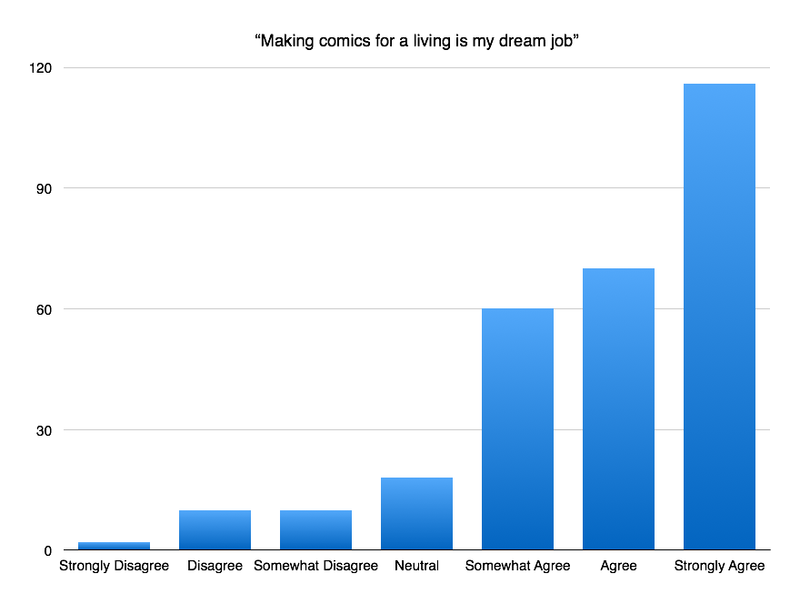 These graphs show responses to two questions in the survey, asking people to rate their level of (dis)agreement with the statements, “To me, making comics is a job like any other” (left) and “Making comics for a living is my dream job” (right). As you can see, most respondents (55%) disagree with the first statement, and the vast majority of them (86%) agree with the second one. This seems to support the existing literature on cultural work in other media industries, where we are told that cultural workers conceive of their jobs as intrinsically rewarding. The opportunities for creative fulfillment, for example, make these jobs desirable, even if they have negative aspects. And it’s hardly surprising to find a similar pattern in a field like comics where many creators identify as fans (88% of current survey respondents). However, the 31-point difference between the two questions suggests that at least some respondents recognize that a dream job is still a job. What if we look at reported levels of job satisfaction directly? Now we see a much more balanced – or perhaps ambivalent – picture. The extremes of above questions are gone, with 29% of respondents describing themselves as dissatisfied, 23% neutral, and 31% satisfied. 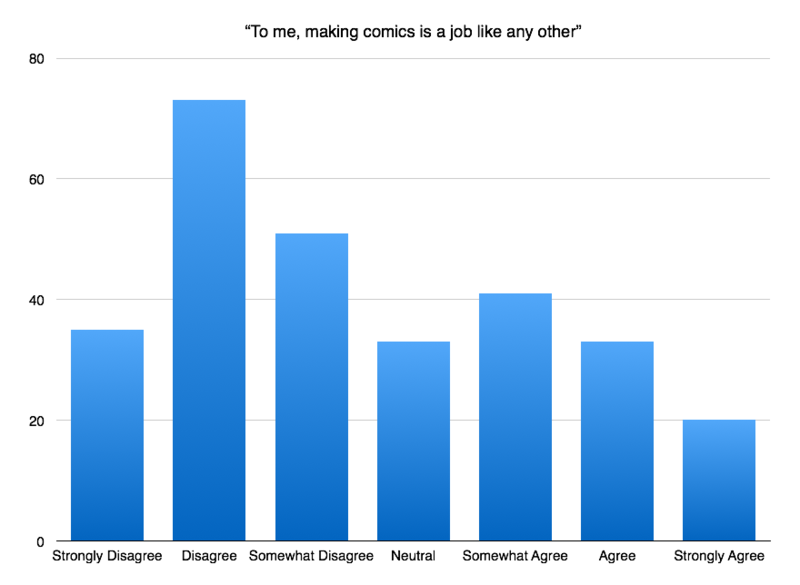 If making comics is your dream job, why isn’t it making you happier to do it? I hope we’ll be able to figure out the reasons behind this discrepancy when all the data is in and available for more detailed analysis. As always, if this doesn’t reflect your experience as someone who makes comics, there’s an easy fix: take the survey and share it with your friends, colleagues, and collaborators. It takes about 20 minutes and will help us develop a more accurate picture of what it’s like to make comics today. Dec 9 ☛ Why is it so hard to think about comics as labour?